Rondino tranquillo : for piano (or harp), Op. 34/2 / Eric Gross. 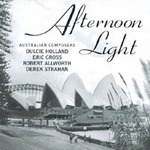 Séance on a wet afternoon : music of Australian composers. Rondino tranquillo, op.34/1 : for harp (or piano) [eScore] / Eric Gross. Rondino tranquillo, op.34/1 : for harp (or piano) / Eric Gross. Rondino tranquillo, op.34/2 : for string quartet or orchestra / Eric Gross. Rondino tranquillo : for string quartet or orchestra, op.34/2 / Eric Gross. Music for piano II / Eric Gross.